Posted on 3, March 2016 by EuropaWire PR Editors | This entry was posted in Austria, Healthcare, Marketing, Technology and tagged Dirk Berneking, ECR, European Congress for Radiology, MRI technology, Toshiba Corp., Toshiba Medical Systems. Bookmark the permalink. VIENNA, 03-Mar-2016 — /EuropaWire/ — Imagine telling your anxious patients that they can have virtual reality experiences while getting an MRI. It’s not a far-off fantasy. It is reality with technology developed by Toshiba Corp. and Toshiba Medical Systems and it will be on display during the ECR (European Congress for Radiology), March 2-6, in Vienna. Toshiba has been focused on easing MRI stress for quite some time and previously released a 72-cm large-aperture open-bore MRI system with Pianissimo quiet scan technology. 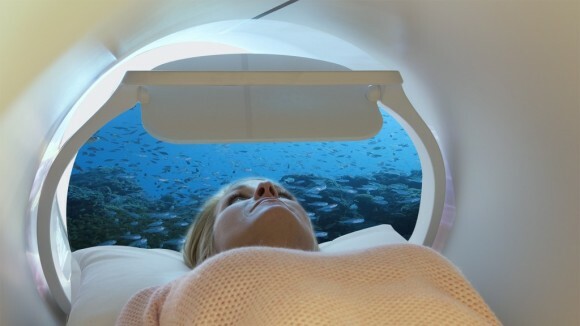 This newly developed projection technology expands on that concept and further improves patient comfort while reducing stress during the MRI exam by projecting high-reality images onto a dome-shaped screen. The semi-transparent dome screen moves in synchronization with the patient table installed inside the bore. Images are projected onto the dome screen and bore cover from a projector installed behind the MRI system from a location that is unaffected by the magnetic field. The images are reflected by a mirror on the patient table, providing a view that helps take the patient’s attention away from the actual examination space. Toshiba Corp. developed the core technologies used in the in-vehicle head-up display and ultra-high presence head-mounted display systems. In addition to the center field, where the colors and shapes of objects are processed, image stimulus is applied to the peripheral field, where special depth and width and object movements are processed, achieving high-reality images with a view angle as wide as 60 degrees or more. The images appear as if they were much further away than the bore core, providing an expansive and bright virtual space for the patient. “A virtual reality that substantially improves patient comfort during the procedure”, says Dirk Berneking, Business Unit Manager MRI with Toshiba Medical Systems Europe. The images can be viewed continuously without changing the image size even as the table moves during the MRI exam. Combined with noise reduction, this new technology will help make a patient more comfortable and less anxious while in the MRI bore. Toshiba is striving for early commercial release of this newest MRI feature. Toshiba Corporation, a Fortune Global 500 company, channels world-class capabilities in advanced electronic and electrical product and systems into five strategic business domains: Energy & Infrastructure, Community Solutions, Healthcare Systems & Services, Electronic Devices & Components, and Lifestyles Products & Services. Guided by the principles of The Basic Commitment of the Toshiba Group, “Committed to People, Committed to the Future”, Toshiba promotes global operations and is contributing to the realization of a world where generations to come can live better lives. SOURCE: Toshiba Medical Systems Europe B.V.
For more information about virtual reality image technology in MRI systems, visit Toshiba at our booth 320 in Expo X2.